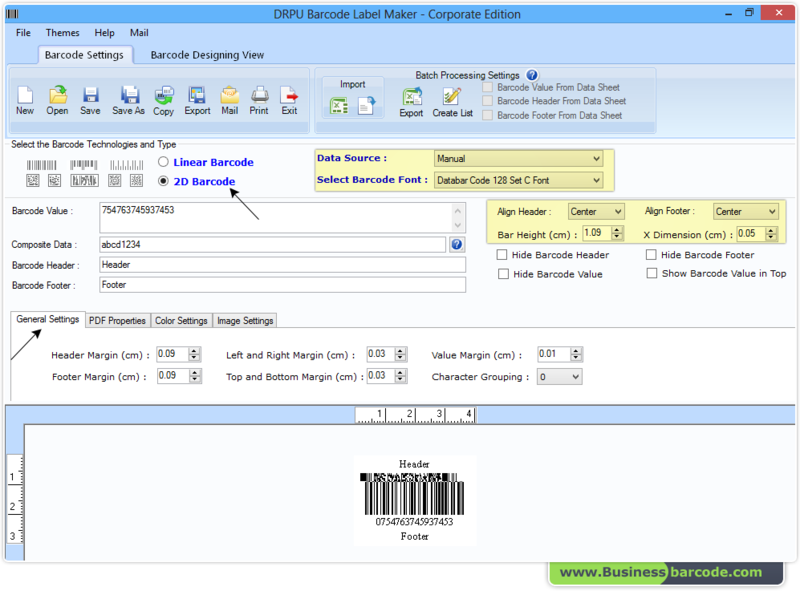 Barcode Label Maker – Corporate Edition creates scan able and printable barcode labels for different organizations. Corporate barcode making program easily generates bulk numbers of barcode labels using batch processing series option. Barcode software is developed with inbuilt email settings to send generated barcode images at user specified email address. Software allows you to print designed barcode labels using inbuilt printing settings with option to select print mode (such as Pre Define Label stock or Manual). Corporate barcode program offers different barcode designing objects (like text, picture, signature, watermark, custom shapes etc.) to generate customized barcode images. Select barcode type (including Linear and 2D) and set barcode header, footer and value as per need. Easily generates barcode labels by using linear and 2D barcode fonts. Provides option to send designed barcode labels at user specified email address with inbuilt email settings. Enables you to print barcode labels using advanced printing settings with option to select print mode including Pre Define Label Stock or Manual. Offers advanced barcode designing view to generate barcode labels by using images, text, shapes, signature and other barcode designing objects. Provides facility for saving designed barcode images in various file formats (JPEG, TIFF, Bitmap, PNG, WMF, EMF, EXIF and GIF). Empowers you to copy and paste designed barcode at different Windows Applications such as MS-Word, MS-Excel and MS-Paint. Codabar, Code 11, Code 128, Code 128 SET A, Code 128 SET B, Code 128 SET C, Code 39, Code 93, Code 39 Full ASCII, EAN13, EAN8, Industrial 2 of 5, Interleaved 2 of 5, ISBN 13, ITF-14, LOGMARS, MSI Plessey, Planet, Postnet, Standard 2 of 5, Tele pen, UCC/EAN-128, UPCA, UPCE, USPS Sack Label, USPS Tray Label, USS-93. Aztec, Data bar, Data bar Code 128, Data bar Code 128 Set A, Data bar Code 128 Set B, Data bar Code 128 Set C, Data bar Expanded, Data bar Limited, Data bar Stacked, Data bar Stacked Omni, Data bar Truncated, Data bar EAN 13, Data bar EAN 8, Data bar MicroPDF417, Data bar PDF417, Data bar UPCA, Data bar UPCE, Data Matrix, Maxi Code, PDF417, QR Code, MICR Font.